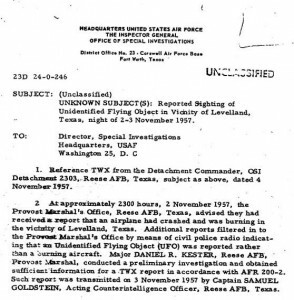 The Levelland UFO Case occurred on November 2–3, 1957 in and around the small town of Levelland, Texas. Levelland, which in 1957 had a population of about 10,000, is located west of Lubbock on the flat prairie of the Texas panhandle. The case is considered by ufologists to be one of the most impressive in UFO history, mainly because of the large number of witnesses involved over a relatively short period of time. The incident beg an late on the evening of November 2 when two immigrant farm workers, Pedro Saucedo and Joe Salaz, called the Levelland police department to report a UFO sighting. Saucedo told police officer A.J. Fowler, who was working the night desk at the police station, that they had been driving four miles west of Levelland when they saw a blue flash of light near the road. They claimed their truck’s engine died, and a rocket-shaped object rose up and approached the truck. According to Saucedo, “I jumped out of the truck and hit the dirt because I was afraid. I called to Joe but he didn’t get out. The thing passed directly over my truck with a great sound and rush of wind. It sounded like thunder and my truck rocked from the flash…I felt a lot of heat.” As the object moved away the truck’s engine restarted and worked normally. Believing the story to be a joke, Fowler ignored it. An hour later, motorist Jim Wheeler reported a “brilliantly lit, egg-shaped object, about 200 feet long” was sitting in the road, four miles east of Levelland, blocking his path. He claimed his vehicle died and as he got out of his car the object took off and its lights went out. As it moved away, Wheeler’s car restarted and worked normally. At 10:55 pm a married couple driving northeast of Levelland reported that they saw a bright flash of light moving across the sky and their headlights and radio died for three seconds. Five minutes later Jose Alvarez claimed he met the strange object sitting on the road 11 miles north of Levelland, and his vehicle’s engine died until the object departed. At 12:05 am (November 3), a Texas Technological College (now Texas Tech University) student named Newell Wright was surprised when, driving 10 miles east of Levelland, his “car engine began to sputter, the ammeter on the dash jumped to discharge and then back to normal, and the motor started cutting out like it was out of gas…the car rolled to a stop; then the headlights dimmed and several seconds later went out.” When he got out to check on the problem, he saw a “100-foot-long” egg-shaped object sitting in the road. It took off, and his engine started running again. At 12:15 am Officer Fowler received another call, this time from a farmer named Frank Williams who claimed he had encountered a brightly glowing object sitting in the road, and “as his car approached it, its lights went out and its motor stopped.” The object flew away, and his car’s lights and motor started working again. Other callers were Ronald Martin at 12:45 am and James Long at 1:15 am, and they both reported seeing a brightly lit object sitting in the road in front of them, and they also claimed that their engines and headlights died until the object flew away. 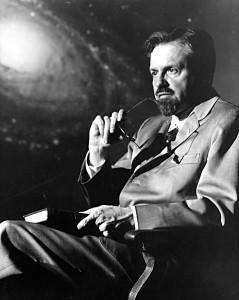 J. Allen Hynek Comments About Levelland Case. November 2, 1957, Levelland, Texas: At 10:50 the police station received a call from a local farmhand and part-time barber, Pedr o Saucedo (a symbolic name), and his companion Joe Salaz. The story: We first saw a flash of light In the field to our right, and we didn’t think much about it – then it rose up out of the field and started toward us, picking up speed. When it got nearer, the lights of my truck went out and the motor died. I jumped out and hit the deck as the thing passed directly over the truck with a great sound and a rush of wind. It sounded like thunder, and my truck rocked from the blast. I felt a lot of heat. Then I got up and watched it go out of sight toward Levelland. Saucedo said the object was torpedo shaped – like a rocket – and estimated it as 200 feet long. Afraid to return to Levelland for fear of encountering it again, the two men drove on to Whiteface, ten miles west of Levelland, where they phoned In their report. Although Saucedo sounded terrified, the officer on duty did not at that time take the report seriously. But an hour later the police got another telephone report. Jim Wheeler, about four miles east of Levelland, had seen a blazing 200-foot egg-shaped object sitting on the road ahead of him. At the same time, his car lights went out and his motor died. The object rose and disappeared. A few minutes later came a call front Witharral, ten miles north-northeast of Levelland; Jose Alvarez reported that his limits and motor had gone dead as he drove near a bright, egg-shaped object on the road. At 12:15 a.m. Frank Williams of Kermit, Texas, reported a similar encounter In the same area. While the officials were out investigating and, incidentally, reporting strange lights themselves, the police station received a call from James Long, Who reported that at 1:15 a.m. he had been driving on a farm road five miles N.W. of Levelland when he came upon a 200-foot-long, egg-shaped mass that glowed like a neon sign. His engine coughed and died, and his lights went out. As he got out and approached the object, which was less than a hundred yards away, it suddenly took off straight upwards. After the object was gone, his engine started easily. These engine stoppings, we remember, also occurred in the French incidents. The next day two more witnesses reported to the police that they had encountered a UFO. Texas Freshman was approaching Levelland at 12:05 a.m. when he noticed his ammeter jump to discharge and back then his motor quit as if it were out of gas and the lights went out. He got out and looked under the hood but could find nothing wrong. Turning around he saw on the road ahead an egg-shaped object with a flattened bottomlike a loaf of bread and glowing not as bright as neon. No portholes or propellers were visible. Frightened, Wright got back into his car and tried to start it, but without success. After a few minutes, the egg rose almost straight up, veered slightly to the north and disappeared from view in a “split instant.” After it was gone, the car started normally.